Is eggs benedict still eggs benedict if you don’t include the hollandaise sauce? Traditionally, that dish consists of an english muffin topped with meat (usually ham or bacon), a poached egg, and hollandaise. That’s four things; the hollandaise is 25 percent of the dish. How far can you change something until it’s no longer that thing? Is it still spaghetti and meatballs if you replace the tomato sauce with alfredo? Probably not! 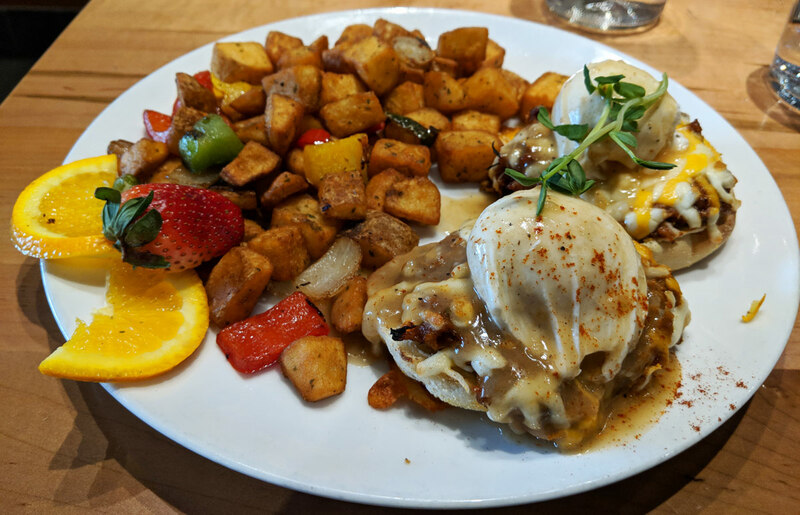 Which is to say that I just ordered the Smash Benedict from Smash Kitchen, and they replaced the hollandaise with gravy. To be fair, they also have a traditional eggs benedict on the menu, so that does kinda give them license to mess around with it in their other offerings. The problem is, I missed the hollandaise. This particular benedict featured an english muffin topped with pulled pork, cheese, the standard poached egg, and the aforementioned gravy. The pulled pork was tossed in a very vinegary barbecue sauce that, while tasty, absolutely dominated the dish. A heaping serving of creamy hollandaise might have helped to cut the vinegary sharpness of the pork, but the gravy was completely lost. It may as well have not even been there. I had to eat most of this with some hash browns to help mellow out that strong barbecue sauce flavour. Still, it certainly wasn’t bad, and the crispy fried hash browns were a very tasty accompaniment. But if I came back, I’d probably just stick with the classic benedict (there was also a crab cake benedict that looked tasty, and yes — that one had hollandaise on it).